While I have always counted New Year's Eve as my least favorite holiday, we had a nice evening. We went with the Sanborns to a New Year's Eve Celebration at the Catta Cerdera Country Club. It was a very nice dinner, including a first course of braised boneless short ribs over manchego polenta cake, fried leeks and pan jus, a second course of tomato basil, a third course of petite filet mignon & shrimp scampi with au grain potatoes and roasted carrots and a fourth course of grand mariner cake. I need to go on a diet. We ended up heading back to the Sanborns' house about 11:00 pm. We celebrated the New Year in their hot tub! 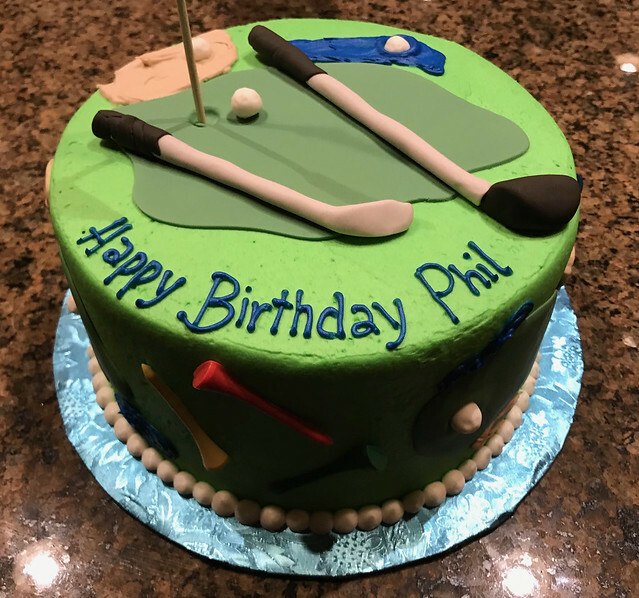 Sharon had gotten Phil a birthday cake. We ended having a piece and celebrating Phil's birthday about 1:30 am. By the time we got to bed in their casita, it was almost 2 am... We stayed in their casita once before.